Manufactured from T6-51 7075 aluminum Stronger than steel sprockets in tensile, yield and shear strength Far lighter than steel for less unsprung weight Most provided with lightening holes Made from full-thickness aluminum for maximum strength OEM Chain type, unless noted Teeth: 48 Fits the following Kawasaki models: ZRX1200R 2001-2005 ZX-12R 2000-2005 ZX-7 1990-1995 ZX-7R 1993-1994 ZX-7RR 1991 ZX-9R 1994-2001 ZZR1200 2002-2005 Please Note: The image displayed is representative of the item, but may vary depending on your specific model. Manufactured from T6-51 7075 aluminum Stronger than steel sprockets in tensile, yield and shear strength Far lighter than steel for less unsprung weight Most provided with lightening holes Made from full-thickness aluminum for maximum strength OEM Chain type, unless noted Teeth: 48 Fits the following Suzuki models: BANDIT 600 1997-2003 GSX750F 1989-2006 GSX-R750 1986-1989 KATANA 600 1989-2006 MARAUDER 800 1997-2004 RF600R 1994-1996 Please Note: The image displayed is representative of the item, but may vary depending on your specific model. 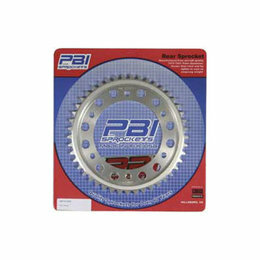 Manufactured from T6-51 7075 aluminum Stronger than steel sprockets in tensile, yield and shear strength Far lighter than steel for less unsprung weight Most provided with lightening holes Made from full-thickness aluminum for maximum strength OEM Chain type, unless noted Teeth: 55 Fits the following Yamaha models: TT-R225 1999-2001 XT225 1992-2007 Please Note: The image displayed is representative of the item, but may vary depending on your specific model. Manufactured from T6-51 7075 aluminum Stronger than steel sprockets in tensile, yield and shear strength Far lighter than steel for less unsprung weight Most provided with lightening holes Made from full-thickness aluminum for maximum strength OEM Chain type, unless noted Teeth: 43 Fits the following Suzuki models: GSX-R1000 2009 Fits the following Yamaha models: FZ1 2001-2010 FZ6 2004-2009 YZF-R1 1998-2010 Please Note: The image displayed is representative of the item, but may vary depending on your specific model. Manufactured from T6-51 7075 aluminum Stronger than steel sprockets in tensile, yield and shear strength Far lighter than steel for less unsprung weight Most provided with lightening holes Made from full-thickness aluminum for maximum strength OEM Chain type, unless noted Teeth: 44 Fits the following Suzuki models: B-KING 2008-2009 BANDIT 1250 2007-2009 GSX-R1000 2001-2008 GSX-1300R 2008-2009 SV1000 2003-2007 SV1000S 2003-2007 Please Note: The image displayed is representative of the item, but may vary depending on your specific model. Manufactured from T6-51 7075 aluminum Stronger than steel sprockets in tensile, yield and shear strength Far lighter than steel for less unsprung weight Most provided with lightening holes Made from full-thickness aluminum for maximum strength OEM Chain type, unless noted Teeth: 45 Fits the following Honda models: CBR929RR 2000-2001 CBR954RR 2002-2003 CBR1000RR 2004-2010 RC51 2000-2009 Please Note: The image displayed is representative of the item, but may vary depending on your specific model. Manufactured from T6-51 7075 aluminum Stronger than steel sprockets in tensile, yield and shear strength Far lighter than steel for less unsprung weight Most provided with lightening holes Made from full-thickness aluminum for maximum strength OEM Chain type, unless noted Teeth: 45 Fits the following Kawasaki models: NINJA 750R 1987-1990 Z1000 1992-1994 ZRX1100 1999-2001 ZX-10 1988-1990 (530 conversion) ZX-11 1990-2001 Please Note: The image displayed is representative of the item, but may vary depending on your specific model. Manufactured from T6-51 7075 aluminum Stronger than steel sprockets in tensile, yield and shear strength Far lighter than steel for less unsprung weight Most provided with lightening holes Made from full-thickness aluminum for maximum strength OEM Chain type, unless noted Teeth: 45 Please Note: The image displayed is representative of the item, but may vary depending on your specific model. Manufactured from T6-51 7075 aluminum Stronger than steel sprockets in tensile, yield and shear strength Far lighter than steel for less unsprung weight Most provided with lightening holes Made from full-thickness aluminum for maximum strength OEM Chain type, unless noted Teeth: 45 Fits the following Suzuki models: B-KING 2008-2009 BANDIT 1250 2007-2009 GSX-R1000 2001-2008 GSX-1300R 2008-2009 SV1000 2003-2007 SV1000S 2003-2007 Please Note: The image displayed is representative of the item, but may vary depending on your specific model. Manufactured from T6-51 7075 aluminum Stronger than steel sprockets in tensile, yield and shear strength Far lighter than steel for less unsprung weight Most provided with lightening holes Made from full-thickness aluminum for maximum strength OEM Chain type, unless noted Teeth: 45 Fits the following Yamaha models: FAZER 700 1987 FAZER 750 1985-1988 FZR600 1989-1990 FZR600R 1990-1999 Please Note: The image displayed is representative of the item, but may vary depending on your specific model. Manufactured from T6-51 7075 aluminum Stronger than steel sprockets in tensile, yield and shear strength Far lighter than steel for less unsprung weight Most provided with lightening holes Made from full-thickness aluminum for maximum strength OEM Chain type, unless noted Teeth: 42 Fits the following Suzuki models: B-KING 2008-2009 BANDIT 1250 2007-2009 GSX-R1000 2001-2008 GSX-1300R 2008-2009 SV1000 2003-2007 SV1000S 2003-2007 Please Note: The image displayed is representative of the item, but may vary depending on your specific model. Manufactured from T6-51 7075 aluminum Stronger than steel sprockets in tensile, yield and shear strength Far lighter than steel for less unsprung weight Most provided with lightening holes Made from full-thickness aluminum for maximum strength OEM Chain type, unless noted Teeth: 43 Fits the following Honda models: CBR929RR 2000-2001 CBR954RR 2002-2003 CBR1000RR 2004-2010 RC51 2000-2009 Please Note: The image displayed is representative of the item, but may vary depending on your specific model. Manufactured from T6-51 7075 aluminum Stronger than steel sprockets in tensile, yield and shear strength Far lighter than steel for less unsprung weight Most provided with lightening holes Made from full-thickness aluminum for maximum strength OEM Chain type, unless noted Teeth: 54 Fits the following Yamaha models: BANSHEE 1989-2006 BLASTER 1988-2006 IT250 1977-1980 IT425 1980 RAPTOR 660 2001-2005 WARRIOR 1989-2004 XT500 1976-1981 YZ465 1980 Please Note: The image displayed is representative of the item, but may vary depending on your specific model. 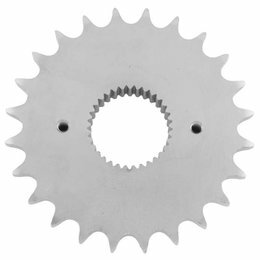 The finest sprocket manufactured in the world Far exceeds the critical requirements of today's vehicles Manufactured from steel alloy approaching 200,000 psi yield OEM Chain type, unless noted Teeth: 52 Fits the following Yamaha models: IT175 1980-1983 IT200 1984-1986 IT250 1981-1983 IT465 1981-1982 IT490 1983-1984 TT-R250 1999-2006 WR250 1990-1997 WR500 1991-1993 YZ100 1982-1983 YZ125 1980, 1983-1998 YZ250 1980-1998 YZ400F 1998 YZ465 1981 YZ490 1982-1990 Please Note: The image displayed is representative of the item, but may vary depending on your specific model.